If 2013 was the year of the one-man show (see my 2013 wrap-up for more on that), then perhaps 2014 will be the year of the one-woman show. 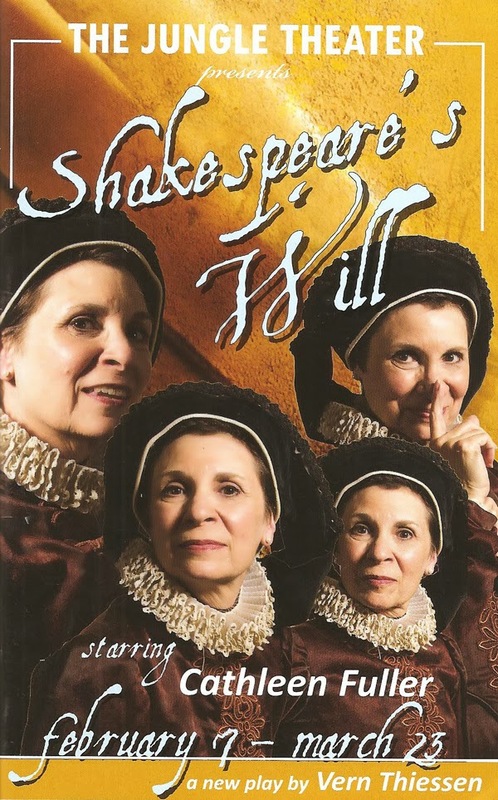 It's certainly off to a great start with the Jungle Theater's Shakespeare's Will, in which Cathleen Fuller commands the stage as the woman behind the man who became perhaps the world's greatest playwright. Playwright Vern Thiessen offers one interpretation of this woman about whom not much is known except for a few bare facts. He fills in these facts with a personality and a relationship that was unconventional (the couple mostly lived separate lives) but worked, and gives us a sense of who this woman might have been. In about 75 minutes, Cathleen as Anne takes us through her life with "Bill," from their first meeting, through marriage and children, through separation as his career took off, to his death and the controversial contents of his will (he left her "my second best bed with the furniture," while leaving most of his estate to their eldest daughter). This all takes place on the day Bill is buried, while Anne is waiting for a visit from his sister. She talks to Bill, recites conversations she had with him, her father, and others, and relives pivotal moments in her life. 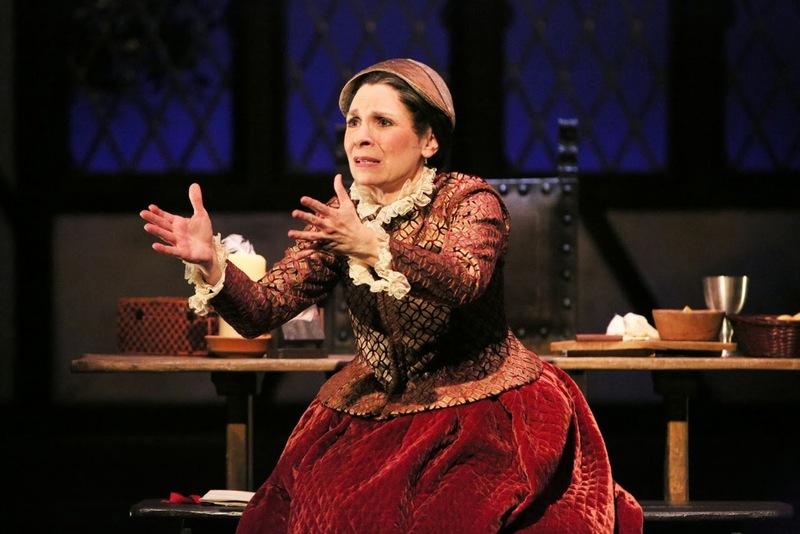 Through it all we get to know Anne as a person, not just a footnote in Shakespeare's biography. She's a funny, smart, spunky, strong woman, fully inhabited by Cathleen as she goes through a range of emotions, from the happiness of new love to anger to grief at the death of a child. The beautifully sparse set designed by Bain Boehlke, who also directs, consists of a bare stage populated only with a bench, chair, and table, upon which sit period-appropriate writing materials and and other props. The stage is framed by two columns on either side, with a bay window at the back, once again creating that perfect diorama effect. Anne wears a beautifully authentic looking dress of velvet and brocade (designed by Amelia Cheever). The entire scene looks very much like it came straight out of an Elizabethan era English country home. Shakespeare's Will plays through March 23 and is a wonderful start to the Jungle's 2014 season, which continues with the comedy Detroit, the Tony Award-winning play The Heiress, and a return of The Mystery of Irma Vep with Steven Epp and Bradley Greenwald, and concludes the brilliant team of Bain Boehlke and Wendy Lehr in On Golden Pond. It's shaping up to be another great year at the lovely little theater in Uptown.